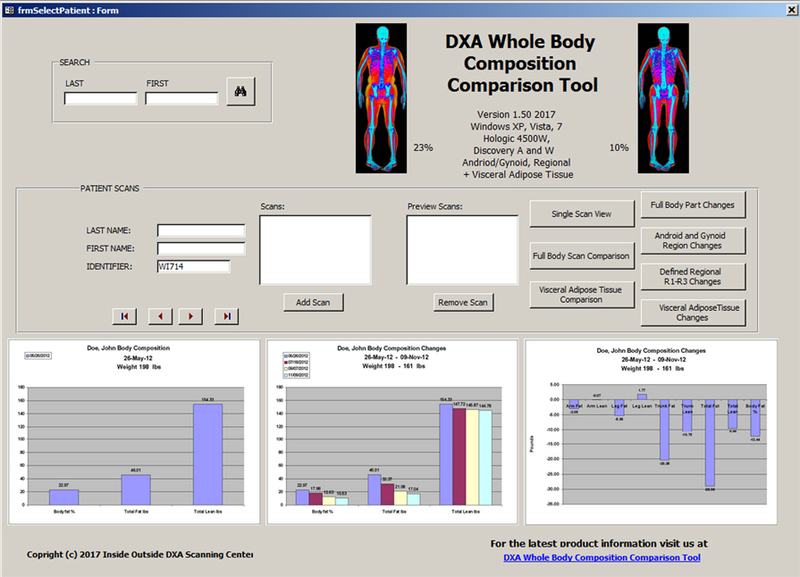 Hologic DXA Whole Body Composition Software. Searches Hologic PatScan.mdb database file by Last Name and First Name. 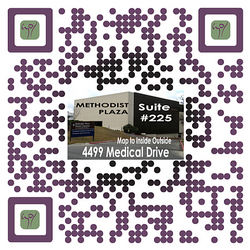 Provides a dated list of scans performed of the search results in PatScan.mdb. Allows selection of listed scans for creation of 3 different types of user friendly graphs. 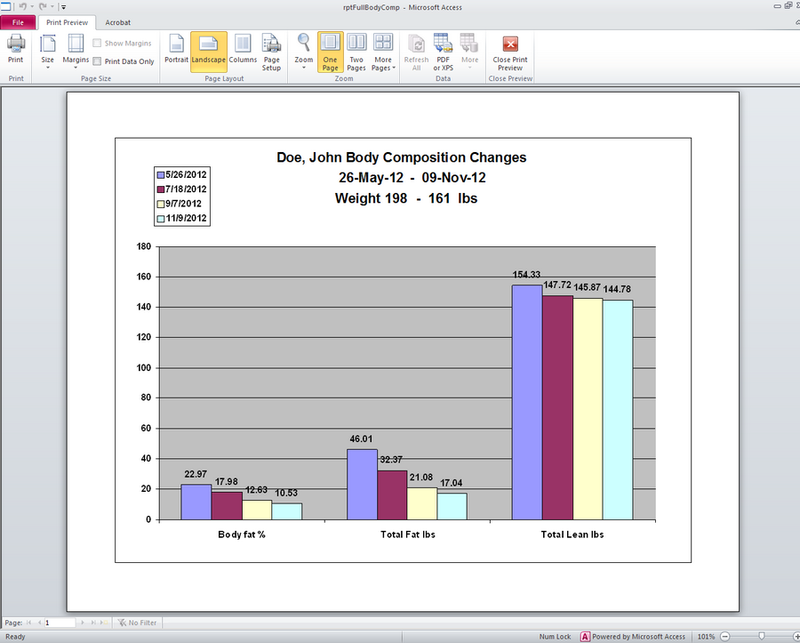 Converts gms to lbs and creates user friendly graphs which can be printed. See Examples Below. 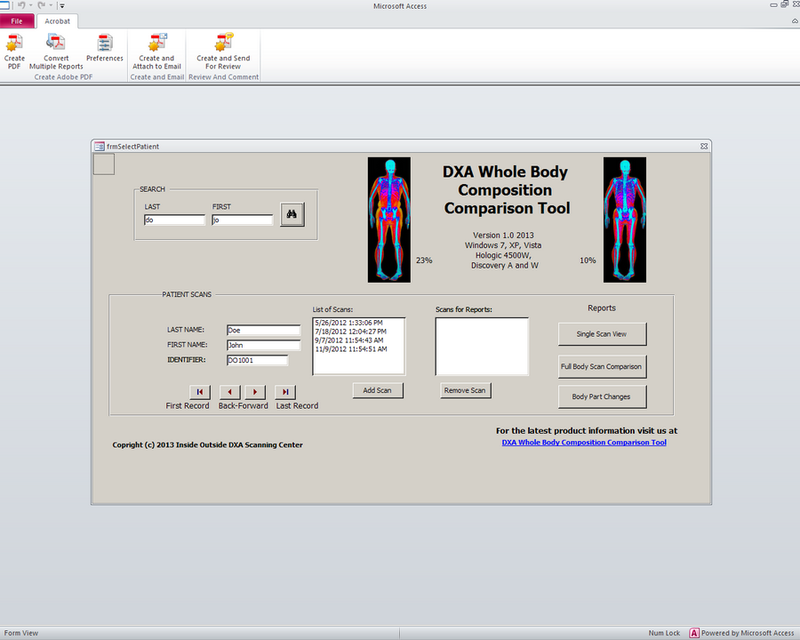 Creates Comparison graph of 2-10 scans with Name, Dates of Scans, %Body Fat, Fat Lbs & Lean Lbs and VAT Indices. 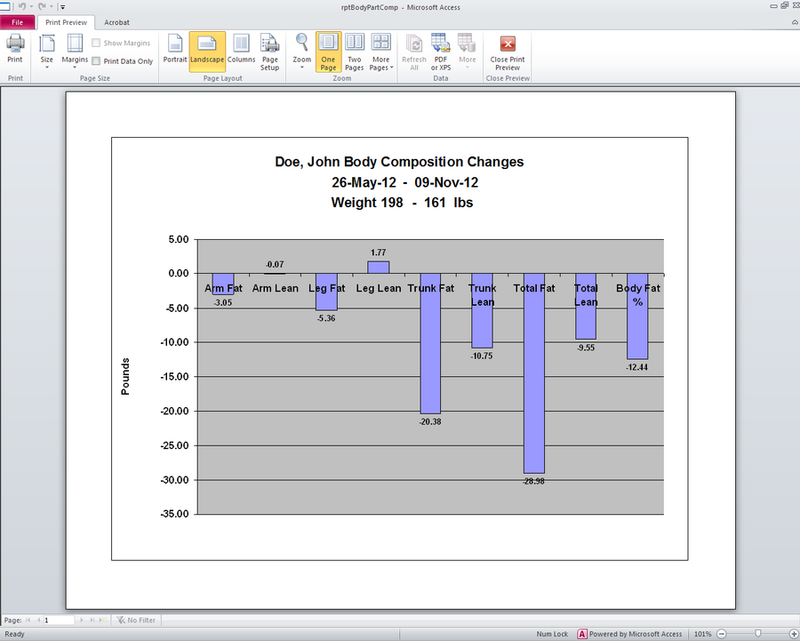 Creates Comparison graph of 2 scans showing lean & fat changes in body regions & VAT changes. Windows 7, XP Service Pack 3 or Windows Vista. Download Microsoft Access 2010 Runtime Here, the file is AcessRuntime.exe 175.5mb. It will install on your computer. This is the only data entry portion of the form. Enter the first 2 or 3 of the Last name and the first 2 or 3 of the First name. The tool searches well by the Last name only but not very well by the First name only. This button searches PatScan.mbd based on your "LAST" and "FIRST" data entry. This button adds a scan to the "Scans for Reports:" box. This button removes a scan from the "Scans for Reports:" box. This button creates a graph of a single scan which was added to the "Scans for Reports:" box. It only works with a single scan in the "Scans for Reports:" box. This button creates a graph which compares the changes between any 2 scans in the "Scans for Reports:" box based on Hologic definition of Regions of Interest. 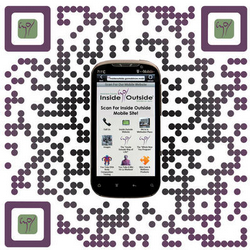 Other Action Buttons are for "Android and Gynoid Region Changes", "Defined Regional R1-R3 Changes", "Visceral Adipose Tissue Comparison" and "Visceral Adipose Tissue Changes". These buttons allow for scrolling to the first record, back and forward by one record, and to the last record in the PatScan.mdb database. After executing the .exe file (double clicking), it will be opened by Access 2010 Runtime. 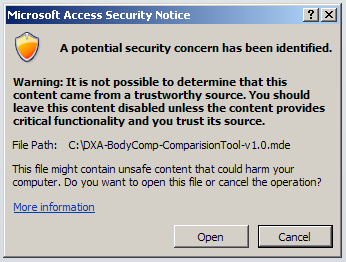 You may or may not see this Security Notice which means that we have not had this software Microsoft Certified. This is not a problem. Click Open and you will go to the Data Entry & Search Form Screen as seen below in Access 2010 Runtime. It probably depends on which version of Acrobat is installed on your computer. This does not affect the functions of this program however. This is the Data Entry and Search Form after it is opened by Access 2010 Runtime or a Full Version of Access. The "LAST" and "FIRST" entry boxes will be blank. There may be an entry in the "LAST NAME" box (usually 10" thick scan), or the "IDENTIFIER" which will be the first record in your PatScan.mbd database. This indicates the program has found your database based on the directory path you have provided us. It is best to put the first 2 or 3 letters of the "LAST" and "FIRST" Name boxes (upper or lower case) and then Click on the Search Button. The tool searches well with just the "LAST" name entry but not just the "FIRST" name. 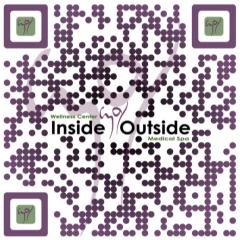 The program will search PatScan.mdb and give you the first entry in the database which matches the letters you have entered. If you have several clients with the same letters use the forward arrow button to find the record you want. In the example we typed "do" for "LAST" and "jo" for "FIRST" and the search yielded Doe, John and his "IDENTIFIER", DO1001. In the "List of Scans:" box all the Whole Body DXA Scans are listed by date, earliest on top and latest at the bottom. In the example, Doe, John has 4 scans. You then select a scan and click the "Add Scan" Button and it appears in the "Scans for Reports:" box. Continue to select and "Add Scan" depending on the type of report you want. If you want a"Single Scan View" Report, only pick one scan, if you pick two scans and you try to do a "Single Scan View" Report, you will get an error message. For the "Full Body Scan Comparison" Report, you should select 2 up to 10 Scans. 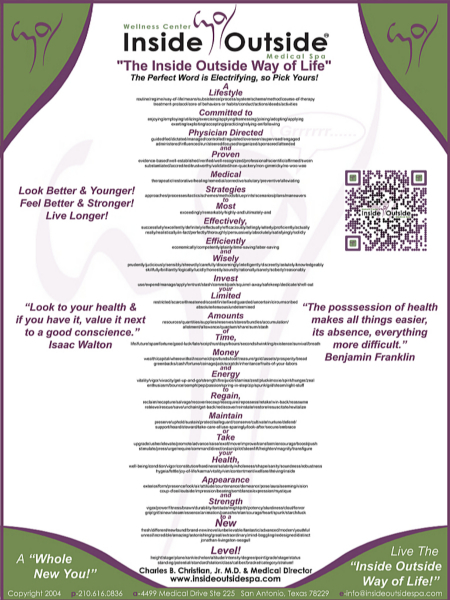 They do not have to be in chronological order as the "Full Body Scan Comparison" Report will sort them by date. The "Body Part Changes" Report requires 2 Scans to be chosen. To remove a scan from the "Scans for Reports:" box, select the scan and Click the "Remove Scan" button. 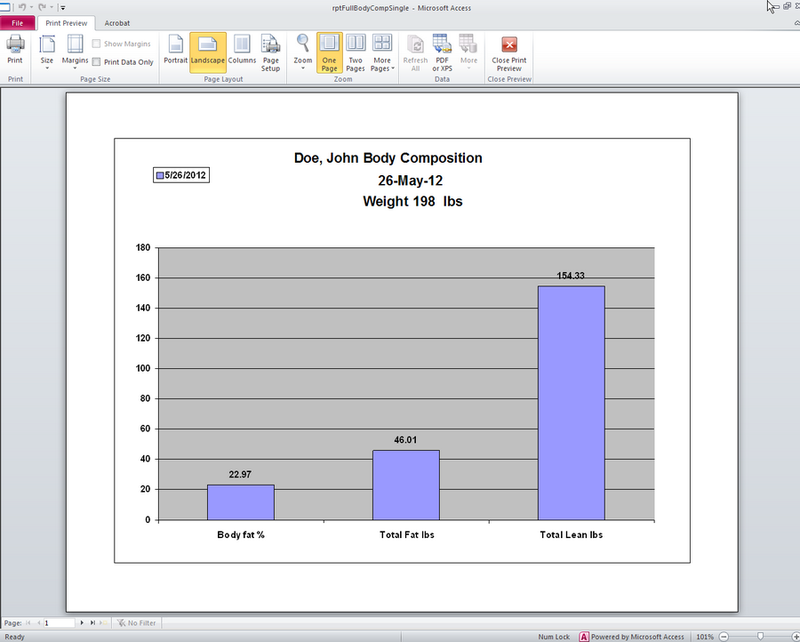 After selecting the report desired the Access Print Preview window will appear with one of the graphs below. Click on the Print icon to print and then on the Close Print Preview option to return to the Data Entry and Search Form to design and select a different report! If you leave the "LAST" and "FIRST" boxes empty there is an alternate way to find a client or just scroll through the PatScan.mdb database. On first opening the Data Entry and Search Form, the first record in your database is indicated in the "LAST NAME" box (usually 10" thick scan). The Alternate Search Method is is to simply use these arrow keys. The first arrow button will take you to the first record in the database (usually 10" thick scan), the forward and back arrow buttons allow you to advance through the database alphabetically by Last Name one at a time. As you display each client, their scans are displayed in the "Scans for Reports:" box. You can create reports for an individual client as their scans are listed. The last arrow takes you to the last record in the database. We are assuming that changes in lean mass are almost always changes in muscle mass.